Stephen Colbert on the drug flibanserin. Last year, the drug flibanserin, trade name Addyi, was approved by the US Federal Drug and Administration, the regulatory body overseeing the approval of medical drugs (among other things). The drug is intended to treat low sexual desire in females, once other concerns are ruled out (i.e., relationship problems, anxiety, etc.). The approval was met with major criticism, as the effectiveness appeared low and the side effects can be significant. Also, many clinicians (and researchers) argue that there are more effective, non-medication ways to treat low sexual desire. Although there isn't good data available yet, it seems like it's not been that successful - in other words, very few prescriptions have been written for the drug. In this clip from last fall, Colbert takes a swipe at the drug, and many would likely agree. 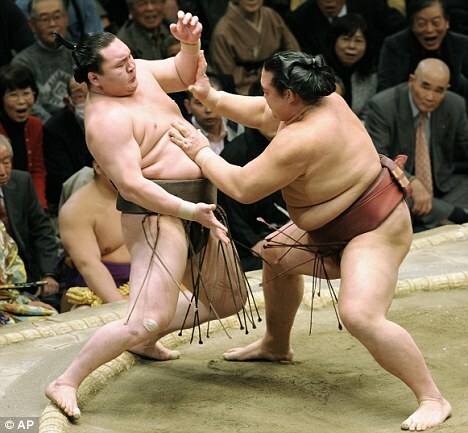 2D:4D ratio predicts sumo wrestler wins. This week in class I discussed the 2D:4D ratio and how it's indicative of prenatal exposure to testosterone. The ratio in homosexual men is closer to that of women than that of heterosexual men. The second (index finger) to fourth (ring finger) digit length ratio (2D:4D) is known to be a putative marker of prenatal exposure to testosterone. It has been reported that fetal and adult testosterone may be critical for development of physical and mental traits such as cardiovascular system, reaction time, aggressiveness and masculinity. Testosterone-driven attributes are associated with success in male-to-male physical competition, which may be proxied by ability in sports. Many researchers have found that 2D:4D is sexually dimorphic and is a negative correlate of athletic performance. This study aims to investigate the associations of 2D:4D with measures of power as another possible testosterone-associated trait using ability in sumo wrestling as a proxy for male physical competitiveness. The measures of sumo performance comprised the sumo ranks and winning percentages of 142 Japanese professional sumo wrestlers. We found that sumo wrestlers with low 2D:4D had higher sumo ranks and better winning records. The significant negative associations between 2D:4D and the athletic prowess of sumo wrestlers provide further evidence of the possible link between high testosterone levels and muscle strength. The relatively small effect sizes found in this study, however, imply that 2D:4D may be a weaker predictor for sports requiring explosive power than for those requiring endurance. New study on the effects of testosterone. Testosterone makes us overvalue our own opinions at the expense of cooperation, research from the Wellcome Trust Centre for Neuroimaging at UCL (University College London) has found. The findings may have implications for how group decisions are affected by dominant individuals. Attempts to understand the biological mechanisms behind group decision making have tended to focus on the factors that promote cooperation, and research has shown that people given a boost of the hormone oxytocin tend to be cooperative. Now, in a study recently published in the journal Proceedings of the Royal Society B, researchers have shown that the hormone testosterone has the opposite effect -- it makes people act less cooperatively and more egocentrically. Dr Nick Wright and colleagues at the Wellcome Trust Centre for Neuroimaging at UCL carried out a series of tests using 17 pairs of female volunteers* who had previously never met. The test took place over two days, spaced a week apart. On one of the days, both volunteers in each pair were given a testosterone supplement; on the other day, they were given a placebo. During the experiment, both women sat in the same room and viewed their own screen. Both individuals saw exactly the same thing. First, in each trial they were shown two images, one of which contained a high-contrast target -- and their job was to decide individually which image contained the target. If their individual choices agreed, they received feedback and moved on to the next trial. However, if they disagreed, they were asked to collaborate and discuss with their partner to reach a joint decision. One of the pair then input this joint decision. The researchers found that, as expected, cooperation enabled the group to perform much better than the individuals alone when individuals had received only the placebo. But, when given a testosterone supplement, the benefit of cooperation was markedly reduced. In fact, higher levels of testosterone were associated with individuals behaving egocentrically and deciding in favour of their own selection over their partner's.